I can't believe it's been 2 years since we finished up my son's bedroom. With that makeover, we moved him up from a twin mattress to a full size, and my symmetry-loving self jumped at the chance to build everything around his focal wood wall, while getting all of the pieces balanced just right. Well, turns out the new arrangement wasn't working very well for his needs. His room is t-i-n-y, and the full size bed took up most of the space. We re-evaluated (and realized he only slept on half of the bed anyway), and decided it would be best to move him back down to a twin size in order to gain some precious floor space back. This wasn't a change I wanted, but I had to take a big gulp and swallow my need for a balanced design and make his room more usable for him. In addition to moving him to a twin size, we also opted for a loft bed. 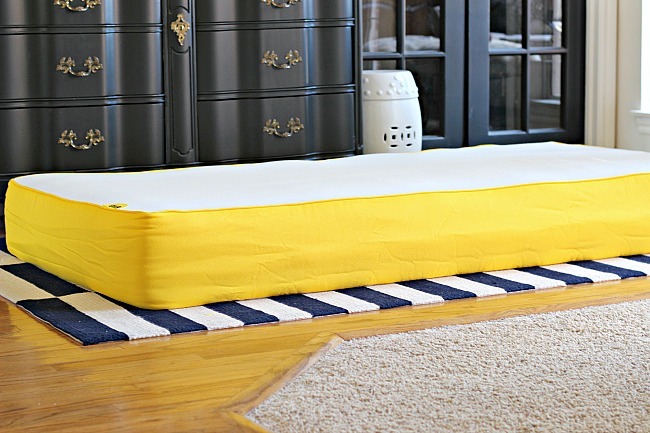 He had one when he was young and loved it (I hated it-changing the sheets and making a loft bed if a royal pain!). He knew my concerns about the feasibility of a loft bed, and agreed to keep it made himself if we would let him have one. ;) We actually ended up making the bed ourselves so we could customize the measurements, I'll talk more about that in a future post. 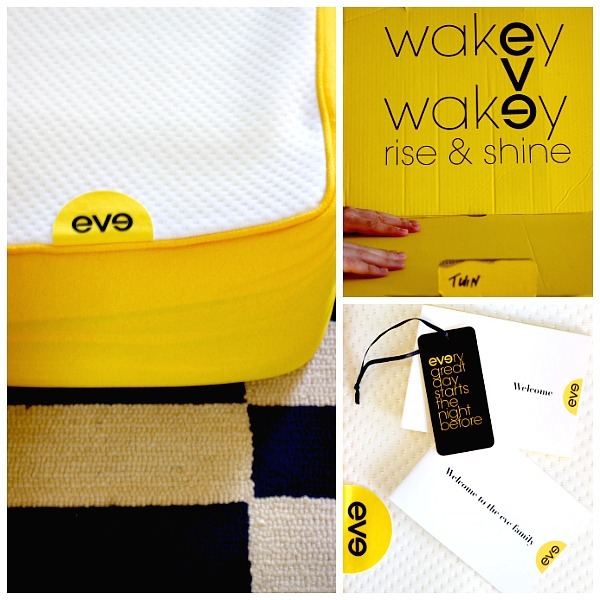 At just the right time, I was happy to discover Eve Mattress. Honestly, I think shopping for a new mattress is one of the worst chores ever. Lying down on bed after bed in showroom after showroom, being confronted with sometimes pushy salespeople scads of options and materials is all just mind-boggling. Then, I still always feel like I'm flipping a coin when the decision is made, because you can't REALLY tell if you'll like the mattress until you've slept on it in your own home. That's the beauty of buying a mattress online with Eve! Shop at your convenience from their website, where all of your questions are answered, and if they're not there's a friendly associate just a chat away to address any of your concerns. 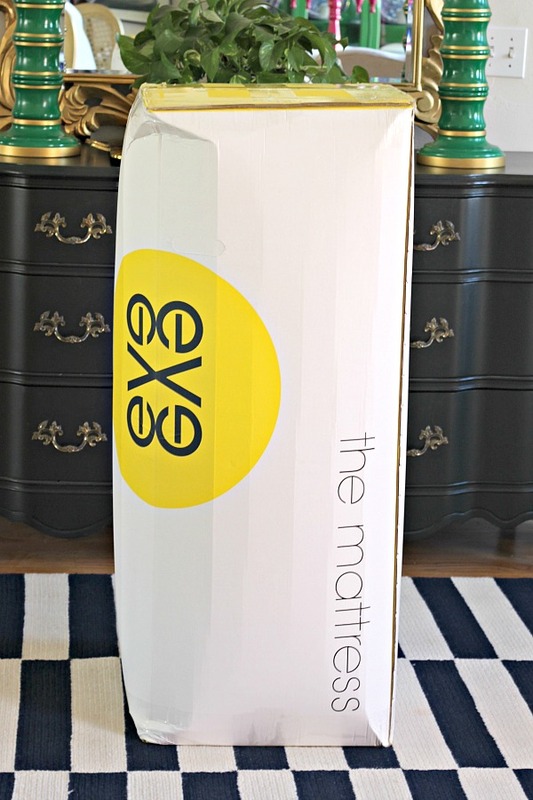 After your selection is made, each mattress is rolled and vacuum packed into a box, and shipped right to your door! Cute, happy packaging is always a bonus, and all of the details needed to know about unwrapping and caring for the mattress are included. Eve Mattress Unboxing from dimples and tangles on Vimeo. After unpacking, it took about an hour for the mattress to fully expand to it's full 10 inches thick. Eve even offers a 100 day mattress trial and no-hassle return policy, if you're not completely happy they'll refund your full purchase price and arrange for free pick-up at your home. Can't lose! And, the kind people at Eve are offering my readers $100 off their total order with the code Dimples100. It's a win-win! He loves it! Eve mattresses are made up of 3 different layers of foam, including a breathable cooling layer to keep it from warming up too much with body heat (as some other memory foam mattresses tend to do), which my son happily reports works! It's firm and supportive and cushy and comfortable all at the same time. I'm secretly waiting for a time when he's away at camp or somewhere and I can try it for the night. ;) The thick, soft cover is smooth and durable. 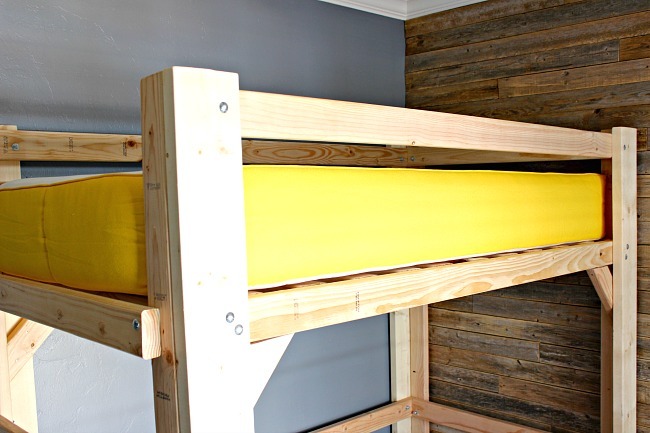 Unlike our last loft bed, the Eve mattress did not need a bunkie board or any other support underneath other than the bed slats, so that was an added bonus. His room is still a work in progress, but I'll keep you posted as we continue to adjust and re-design. The major components are staying, but I'll need to re-work some things like artwork, lighting, bedding, and a little bit of furniture arranging. 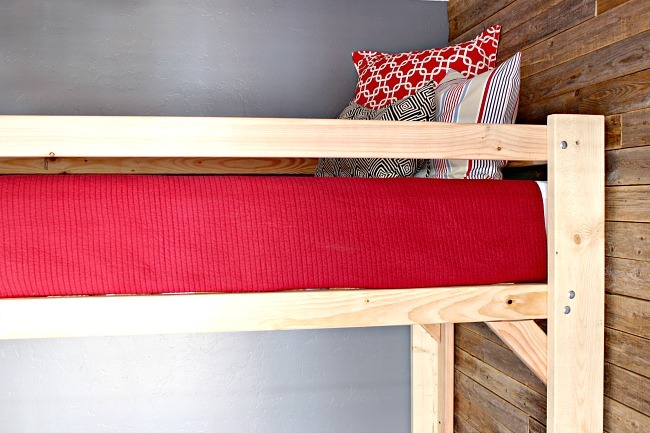 First up on the list- getting rid of the bare wood and putting a finish on the loft bed. 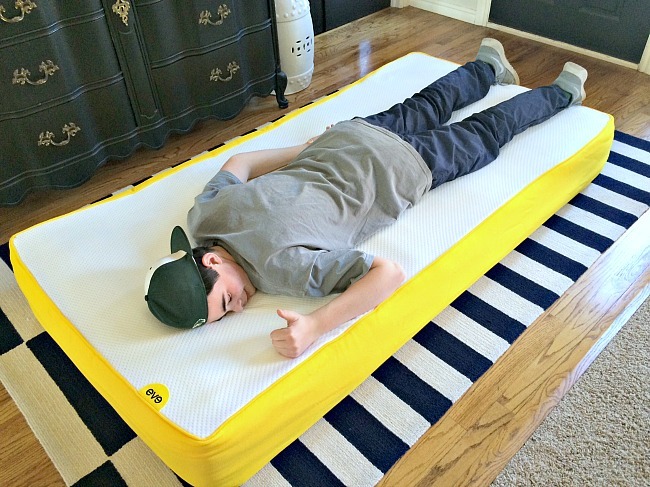 Thank you to Eve for providing this mattress for me (and my son!) to review. As always, all opinions are mine and I only share products with you that I truly stand behind. Thank you for supporting companies that partner with Dimples & Tangles! Changes at this point in our kids life is the only constant thing. 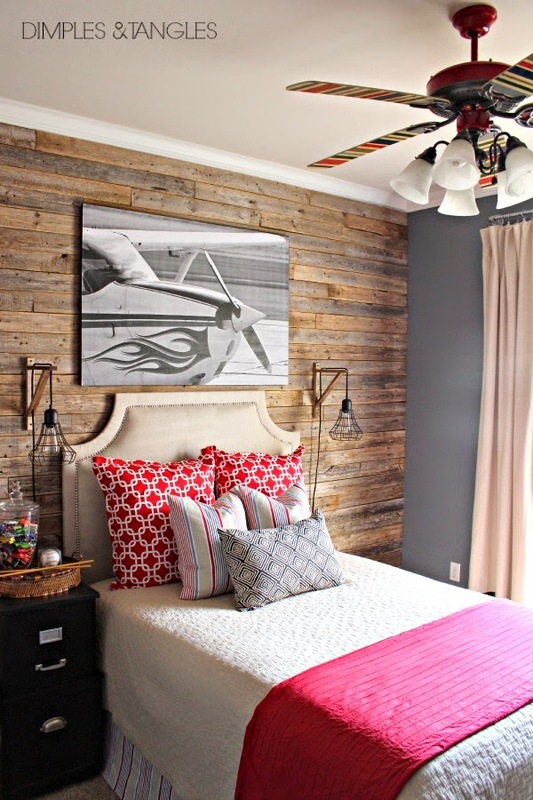 I had to re-do my oldest son's bedroom 2 times to fit into his life! CaN'T WAIT to see the room come together! 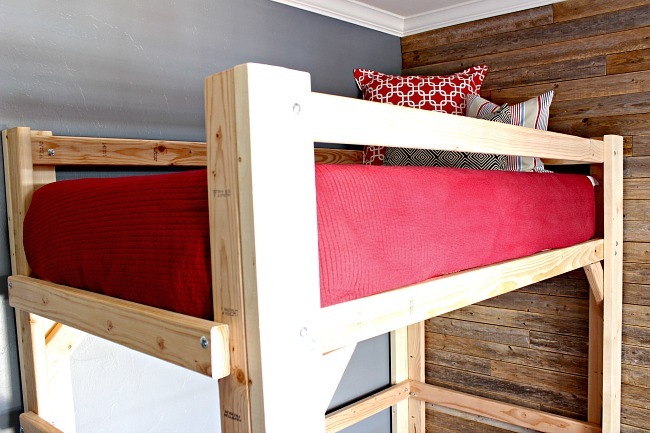 Can't wait to see more of that loft bed. Good for you for choosing a layout that works for him. I don't doubt I'll hit that point with my girls someday and I know I will have a hard time swallowing my own preferences. The mattress sounds awesome too. I am dying for a new one for our master! What a fun room!! Lucky boy! !